Total destruction and total football. All four goals were of supreme quality as was the build-up play in general, featuring flicks and tricks normally associated with Brazil. What was particularly impressive was the patience of the Germans. The first fifteen minutes of the second half saw them very much on the backfoot, fending off a rejuvenated England. Ultimately they played possum and picked their moment before delivering knockout punches to the opposition. While England have themselves to blame for giving so much room and respect to their old enemy, the Germans earned their praise by playing outstanding football and by being three or four steps ahead of their opponent at every turn. In the end 4-1 was somewhat respectable considering Joachim Low’s men took their foot off the pedal during the final stretch and were content to pass the ball around. If Germany can match this performance for the remainder of the competition then they must be considered favourites, however it is doubtful that they will have an easier task than this ahead of them. Benefitted from a poor decision to kick things off before putting Mexico to the sword as expected. One wonders what they would do with the space England afforded the Germans. Mexico are going home but the young striker has given Alex Ferguson something to think about. Few predicted they would have gotten this far and the South Americans will fancy themselves to at least make the semi-finals. It’s a pleasure to see the inaugural tournament winners play with such confidence and composure in 2010. Finally coming good after a quiet start, the 23-year-old Ajax forward won the game with a goal worthy of winning the tournament, made all the more emphatic by being framed by the lashing rain. The sole remaining African team kept their heads and were worthy victors. It was a shame to see time-wasting and play-acting tactics employed at the end but that’s the modern game for you. Did what they had to do, boring everyone to death in the process. But will they learn anything from it? Not likely. While they will rightly feel aggrieved following Lampard’s “goal that never was”, England had plenty of opportunities to level things and failed to take them. It’s the oldest cliché in the book that goals change games and 2-2 certainly makes things much more balanced, but hypothetical arguments are a waste of time when you are outplayed and outclassed by a superior side, as England unquestionably were. Since the opening game these players have not played together. In this game they committed footballing suicide by repeatedly straying from their positions, thus giving the Germans the space they needed to duly tear England apart. While the F.A.’s appointed talking head was quick to assure gathered journalists that Capello’s contract runs until 2012, his body language and veiled statements painted a different picture. 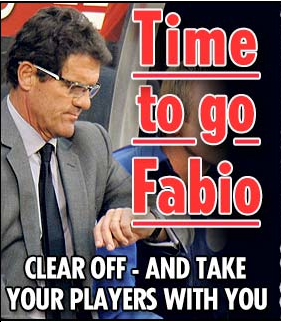 The truth is that should Capello get his marching orders, he’s better off for it. Not only shall he benefit financially but why would a man of his pedigree wish to be denigrated by a myopic media and idiotic fanbase that place the blame of England’s failure directly at his door? The reality is that the England job is a poisoned chalice for any manager. How does one get the best out of a team that fails to play like one? In the aftermath of their humiliation, the majority of fingers are being pointed at the Italian. This is no surprise and of course the manager must accept responsibility (and Capello has) but the real questions must be asked of a collection of selfish individuals who refused to follow their orders and were mauled because of it. It really is unfair to single out one English player considering they were all abject but considering Rooney was touted as the man to carry the hopes of a nation on his broad shoulders and deliver glory only for him to fail to turn up in any of the four games played, it’s a pretty poor ending to a story laced with optimism, hope and unrealistic hyperbole. Sorry Frank but even Stevie Wonder can tell you that. The ex-Manchester United defender was most certainly not ready for his close-up. Both of Sunday’s games featured terrible officiating from the men at the side of the pitch. England will debate long into the night about Lampard’s Pedro Mendes-esque “goal” while Carlos Tevez was clearly offside for Argentina’s first goal. The ugly debate about goal-line technology has reared its head once again while FIFA remain stubborn. Perhaps a more pertinent question would be why FIFA didn’t employ the additional goal-line officials that worked so well in the Europa League? Ran out of comebacks. Their admirable team spirit and work ethic masked a worrying lack of depth. Outside of Donovan, Dempsey and Howard the Americans lack leaders and special players. They simply have not progressed enough since the previous World Cup (where incidentally they also fell at the feet of the Ghanaians) and despite the profile of “soccer” rising in the country, the team hasn’t evolved enough. Captain Ji-Sung Park wanted a repeat of their semi-final charge of 2002 but it wasn’t to be. Gary Linker claimed before Brazil/Portugal that anything less than a 4-4 scoreline would give license payers the right to complain. Considering the stage of the competition and what was needed from both teams it was silly to expect anything other than what we got. Like the French, poor Mick just doesn’t want to be there. 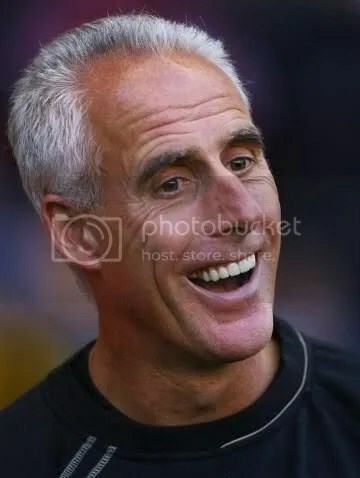 Greeting the additional five minutes at the end of the game with howls of derision, Mick exclaimed “Get them off! It’s been awful!”. Poor chap. Friday saw a splurge of poor sportsmanship. The Brazil/Portugal snoozefest saw Duda and Tiago booked for ordering the referee to send a player off and diving respectively while Fernando Torres continued to endear himself to everyone other than Liverpool fans by pulling off the most embarrassing dive seen on a football pitch since Alberto Gilardino took the piss against Celtic in the Champions League a couple of years ago. Perhaps Torres belongs in the winners column as his pathetic actions got Chile’s Marco Estrada sent off but El Nino would later tweak his ankle and his game would end in the 54th minute. It’s been a poor showing from the Liverpool striker thus far, and he will know it. Das Bild (Germany): Germany’s most popular tabloid reacted with glee to Die Mannschaft‘s victory over England. Das Bild proclaimed, “Jungs, we love you!”, a reference to the Jogi Löw’s young side and their phenomenal performance against the Three Lions. 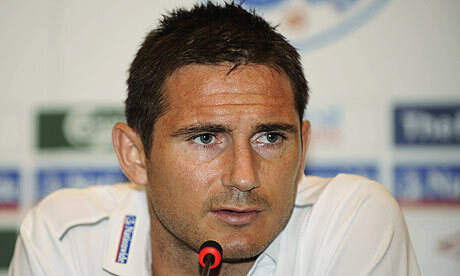 Die Welt described Frank Lampard’s controversial effort as ‘revenge for the Wembley goal’, referring of course to Geoff Hurst’s equally contentious strike against West Germany in 1966. In that case, the goal was given when perhaps it should not have been. The broadsheet prints a dizzying and unconventional match report, which emphasises the dream-like quality the result had for German fans. The Mirror pulled no punches in its evaluation of the defeat. 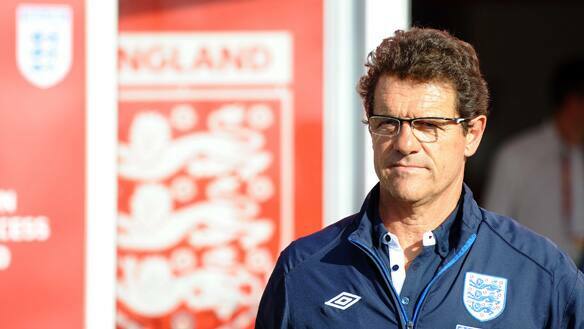 Fabio Capello, they say has to go. The Mirror bemoans the new contract offered to the former Real Madrid manager just before the tournament which, they say, will entitle him to a vast sum in compensation. The Sun also subscribes to the idea that the Italian is at fault while also offering partial blame to the players who they say “shamed the shirt”. The Sun argues that England’s results in the Group Stage were indefensible, referring to the 1-0 victory over Slovenia as “scraping through”, despite having praised Capello and England after that particular performance in previous editions. The Mexican broadsheet criticises Italian referee, Roberto Rosetti, for allowing Argentina’s opening goal which was shown to be clearly offside. The World Cup ended for Mexico where it had all begun in , Soccer City. El Universal bid its farewell to Blanco, Perez, Torrado and Rafael Marquez and damns the Argentine performance as showing ‘no spectacular football’. It was an all too familiar end for El Universal. The newspaper drew parallels with Mexico’s demise in 2006, also at the hand of the Albiceleste. In his regular and always insightful column, Johan Cruyff states that he believes that Chile have taken over the Netherlands’ role as a ‘trendsetter’ of beautiful football. Cruyff lends his ardent support to Marcello Bielsa’s side which he says create more chances than anyone else and entertain more fans than any other side at this World Cup. Cruyff also considers the new push for technology in football in the wake of yesterday’s events. He firmly believes that goalline video technology is fine but in other instances, such as offside, handball etc, Cruyff firmly believes that technology should be avoided. The former Barcelona manager argues that football is a ‘game of mistakes’ and that placing too much emphasis on video technology would hinter the sport rather than help it. 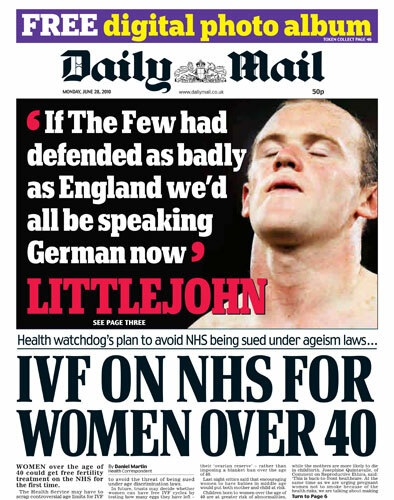 The Daily Mail, which in the lead up to England v Germany purveyed a lot of copy offensive to Germans took it a step further in the aftermath of England’s 4-1 defeat to Jogi Löw’s side. Our old friends in the New York Post have been at it again. Following the United States’ 2-1 defeat to Ghana after extra-time, ‘The Post’ has this to say about The Beautiful Game. Brazil and Portugal progressed to the Round of 16 as group winners and runners up respectively. The build up to his game promised us an exciting battle of two teams who knew how to entertain. What we got instead was perhaps the worst ninety minutes of football yet seen at this World Cup. Brazil started promisingly. Dani Alves, replacing the injured Elano in the starting line up, flashed a bouncing shot just wide of the target. Portugal were finding it difficult to establish themselves in possession. Brazil vigorously pressed Portugal no matter where Carlos Queiroz’s side had control of the football. Benfica fullback Coentrão, who was catching the attention of the world’s media with some impressive displays against Côte d’Ivoire and North Korea, once again attacked down the left before sending a cross deep into the penalty area. Internazionale goalkeeper Julio Cesar slapped the incoming football as far as Tiago on the edge of the penalty area. Tiago passed to Ronaldo whose effort was blocked. Cristiano Ronaldo and his teammates were finding it difficult to penetrate the experienced and accomplished Brazilian defence. Tiago’s sliced volley indicative of Portugal’s lack of attacking prowess so far. Portugal might have breached the wall of Brazilian defenders in the 25th minute. A long pass over the top for Cristiano Ronaldo was deliberately diverted by the arm of Juan. The referee showed the Roma centreback the yellow card and was immediately accosted by three Portuguese players. Benito Archunia did not appreciate the advice of Duda, and added the midfielder’s name to his burgeoning notebook. Brazil had the advantage in terms of possession and territory and came the closest to opening the scoring in the first half when Nilmar’s close range shot was pushed superbly on to the post by Eduardo. Luís Fabiano supplied an elegant chip for the Villarreal youngster, but Nilmar was unable to convert. Fabiano himself should have scored. A terrific cross from Maicon on the right was met by the head of the Sevilla striker. Fabiano headed into the ground and wide. His reaction, to lie face down on the turf, was telling. Brazil should have entered the break with a lead but instead found themselves level with Portugal in a biting encounter, Benito Archunia producing seven yellow cards in the opening forty-five minutes. If the first half was uninspiring, the second was disheartening. Neither side could muster a prolonged period of pressure in the second half despite a bright start from Cristiano Ronaldo. The Real Madrid forward woke a sleeping audience with a blistering run from just inside the Brazilian half, taking the ball as far as the byline. Lúcio was at hand to tackle Ronado but his sliding challenge acted as a cross for Raul Meireles who had broken forward into the Brazilian penalty area. Meireles’ poor effort was poked at Julio Cesar from an angle. It had appeared as if Ronaldo was going to seize control of the game and test Brazil. This was not to be, over the next forty-five minutes the Portuguese’s only meaningful contribution was a succession of poorly executed free-kicks. The second half petered out with no sign of a goal at either end until stoppage time. The decision of the referee to award five minutes of extra time was a questionable one but it did provide Brazil with their only chances in the second half. Ramires, who was brought on to replace Julio Baptista, tried a shot at goal from twenty-five yards. His attempt was subjected to a wicked deflection which almost caught Eduardo out. The Portuguese goalkeeper had been dependable throughout the Group Stage and had to reach to fend off the dipping football. The draw allows both sides to progress at the expense of the Côte d’Ivoire, who beat North Korea 3-0. Both Brazil and Portugal will certainly be watching with interest tonight as Chile face the European Champions, Spain, for top spot in Group H. Should Spain qualify as runners up then, in Spain versus Brazil, we may see the kind of breathtaking football that this match failed to deliver to us and the capacity crowd in Durban. Portugal routed DPRK in inclement conditions at Green Point Stadium, Cape Town. Portugal’s goal of qualification from the group stage would potentially come down to their goal difference versus that of the Ivory Coast and they quickly signaled their intent. The North Korean set-up that had proved quite effective in stifling Brazil was replaced by a more attacking set-up, 4-5-1 becoming 3-5-2. Both teams opened with some slick passing on the notably zippy surface. Portugal had the best of the early exchanges with Ricardo Carvalho hitting the post from a corner. Ri Myong Guk came to meet Tiago’s thumped corner but was unable to divert it. Carvalho was on hand to power a header against the post. In an entertaining, end-to-end opening half North Korea showed tidy passing and set up a fine long range effort from Cha Jong Hyok. The defender’s powerful strike just swerving wide of Eduardo’s goal. Portugal were exhibiting far more ambition than they did against Côte d’Ivoire and opened the scoring with a wonderful move. Tiago threading a beautifully judged pass through the North Korean defence, taking three Koreans out of the game in the process, in to the path of Porto’s Raul Mereiles who wound up before powering his shot under Ri Myong Guk. The goal ended North Korea’s resistance. The team which had so valiantly harried Brazil and shown commendable control and passing in the opening thirty minutes here, immediately sank and allowed the Portuguese to control the game from thereon. They were able to end the half only a goal down but it wasn’t long into the second half before they conceded again. Breathtaking interplay between Raul Mereiles and Hugo Almeida, brought into the side in place of Liédson, allowed Simão to advance on goal where he produced a neat finish. The third followed soon after. Portugal circled the North Koreans seemingly fixated on securing their passage to the Round of 16 on goal difference. Coentrão, Benfica’s highly rated left-back, curled in an excellent cross to the unmarked Hugo Almeida who justified his selection with a headed goal. Cristiano Ronaldo was excelling in his free-role in the second half. Carlos Queiroz unleashed the Real Madrid galactico after keeping him mostly on the left in the opening period. 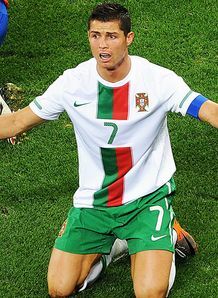 Ronaldo was on hand to offer an assist for the fourth. The Ballon d’Or winner darted forward to retrieve a ball by the byline. He was given options by Hugo Almeida and Tiago who were sprinting towards the penalty area. Ronaldo chose the latter. He rolled a pass towards the edge of the penalty area where the Atlético Madrid midfielder was able to place the ball past the now beleaguered Ri Myong Guk. The star wingback in this group is undoubtedly Maicon, although the Brazilian would have been pleased to produce a performance of the magnitude of that given by Coentrão this afternoon. The talented leftback was relentless. He constantly overlapped his wingers and looked to get involved in almost every attack. He very nearly added a goal to this consummate outing. Ronaldo, wreaking as much havoc as possible on the Koreans, played the leftback through at an angle. Coentrão’s effort just missing the target on this occassion. The Associated Press reported that this match would be the first live broadcast of a World Cup game in the demagogic totalitarian state. The state broadcaster may well have shut down the feed as Liédson added the fifth with one of his first touches. The North Korean defence was visibly fatigued at this point, and this tiredness manifested itself after a botched clearance bobbled up to Liédson who did not fail to convert the easiest of opportunities. Cristiano Ronaldo had not scored for Portugal in nearly two years and had come close several times in the first eighty minutes, even hitting the crossbar with a trademark strike from distance. His goal did come but not in his usual swaggering fashion. Ronaldo pounced upon a loose ball following a tackle just outside the penalty area. Ri Myong Guk attempted to challenge the Portuguese star but the ball ended up rolling along Ronaldo’s back and off the top of his head before it fell to his feet. He tapped in Portugal’s sixth and his smiles emphasised both the comical nature of the goal and his relief at having finally ended a long running goal drought. Tiago added a seventh before the end but by now the scoreline had little importance. Portugal will now surely join their former colonial power in the last sixteen. The Portuguese press had slated their national team before the tournament but they will have had little to criticise here. Portugal played a fast paced, clinical game of football, albeit against questionable opposition. They will now face the Seleção with the top spot in the group at stake. Brazil took a commanding lead in Group G with a comfortable 3-1 victory over Sven-Göran Eriksson’s Côte d’Ivoire. Luís Fabiano of Sevilla was the hero for the Seleçao, notching the two opening goals. Galatasaray’s Elano added a third before Didier Drogba enkindled brief hopes of a comeback for the Elephants with a late consolation. A bad tempered second half saw numerous bookings, a repulsive tackle from Kader Keita on Michel Bastos and a potentially serious injury to Elano. The bearer of the famous number 10 shirt of Brazil, Kaká, was sent off in dubious fashion by Stephane Lannoy following a shameful deception by Kader Keita. Many fans were disappointed with Brazil’s lack of penetration against North Korea in the opening game but there can be no such criticisms following their victory here. The Seleçao took full advantage of every opportunity presented to them by the Ivory Coast and took the lead in the 24th minute via a clinical finish from Luís Fabiano. Kaká has struggled for fitness and form this past season but will have been pleased to see his measured through pass lead to a goal. The Real Madrid midfielder’s pass was taken in stride by Luís Fabiano, who revealed tremendous concentration to slow the ball before clinically finishing into the top corner. Didier Drogba and the Côte d’Ivoire were stunned by the goal. Prior to falling behind, the Ivorians had produced some high tempo movement and passing but were thwarted by their inability to secure that elusive final ‘killer’ pass. Brazil slowly manhandled the Côte d’Ivoire out of the match and were unperturbed throughout the remainder of the first half. Brazil doubled their lead just five minutes after the restart. Fabiano again the scorer, this time with an even more impressive effort. The Sevilla forward flicked the ball over the head of one defender, then another before controlling the ball with his shoulder and unleashing a half-volley towards goal. Boubacar Barry was helpless. It was a tremendous moment of artistry, one worthy of the coveted number 9 shirt inherited from such magicians as Ronaldo and Tostao. Some will point to the replays and what appeared to be two debatable instances of handball but the moment of inspiration was certainly worthy of a goal. Luís Fabiano’s efforts had effectively ended the match as a footballing contest. The introduction of Gervinho for the lamentable Aruna Dindane did imbue some vigor into the Ivorian side. His slipperiness and willingness to try and beat defenders was sorely missed in the first half. Slow and steady became quick and expressive for Brazil around the hour mark. Wingback Maicon, the scorer of that impossible goal against North Korea, marauded down the right flank and found Robinho, who in turn laid off for Kaká. A shot soon followed but was safely slapped away by Barry. Do not mourn for Joga Bonito for it has endured. The efficiency of Dunga’s Brazil may sometimes mask the exuberant element to his side but moments of swift interchanging still surface and we were beginning to catch rare glimpses of it. Brazil soon added to their advantage. Kaká was finally finding his form again, beating Tiené effortleslly before gliding a pass along the turf for Elano who diverted it into the net. In the process he registered his second goal of the tournament in as many games. Elano will be thankful that he reinserted his shinguards after removing them in his goal celebration. The former Manchester City midfielder was brought from the field by stretcher following a nasty tackle. The match was quickly becoming ill-tempered. Brazil continued to display flashes of excellence. One touch passing set Maicon on another jaunt into the Ivorian half, this time he thrilled the 84,000 in attendance with a perfectly executed nutmeg. Tioté should have been dismissed by Stephane Lannoy following a horrific challenge on Michel Bastos, who himself was lucky that he was not seriously injured by the Tioté’s recklessness. The Côte d’Ivoire had been poor at creating chances in both this match and their previous fixture with Portugal. They created their first goal of the tournament out from nowhere. Gervinho was in an expanse of space in the centre of the field. It was there that he decided to embark on a rampage past three Brazilian defenders before he ended up at the byline. The Lille player spotted Romaric’s late run towards the penalty area and offloaded. Romaric himself showing terrific awareness to loft the ball onto Didier Drogba’s head after his captain’s well timed run. Drogba headed home and returned the ball hurriedly to the centre-circle. The heated second half culminated with the dismissal of Kaká for a second bookable offence. The Brazilian star backed into Kader Keita and appeared to have his elbow slightly elevated into the Ivorian’s chest making Keita’s writhing fall to the floor all the more dispicable. Keita covered his face, conning the referee’s assistant into believing that Kaká had violently lashed out at the Galatasaray winger. An appeal will surely follow for Kaká. In any instance, missing a somewhat meaningless game against Portugal will be of no great harm to Brazil’s World Cup ambitions. The first round of group stage fixtures at the 2010 World Cup is complete. Every team has now taken their World Cup bow in South Africa and we’ve already been left with some intriguing permutations for qualification to the last sixteen. World Cup Daily will now take a look back at this mini-milestone stage of the competition. Group A is a bit different by way of having already completed one game of the second round of fixtures. The result was a potentially crippling one for the Bafana Bafana, as they lost to Uruguay 3-0 while also losing their first choice goalkeeper to suspension. France play Mexico tomorrow with the winner of that game taking a massive step towards the next round. Here is the table as it stands. The hosts, South Africa, achieved what may yet be their best result in the competition in the tournament’s opening game against Mexico. Siphiwe Tshabalala’s incredible strike will live long in the memory of all who witnessed it. 1998’s winners France stuttered in a 0-0 stalemate against Uruguay. Although they failed to impress against Les Bleus, Uruguay now control Group A courtesy of their victory over Bafana Bafana in Pretoria this evening. Diego Forlan lead the line with conviction and scored two goals, taking him to the top of the goalscoring standings for the tournament. The outcome of Mexico v France is key to the future of the group. If there is a winner to that game then the hosts will be all but eliminated and the victor should progress to the last sixteen alongside Uruguay. A draw will throw open a range of possibilities and will ensure an exciting climax, with South Africa’s participation in the World Cup still very much alive. The Republic of Korea and Argentina sit loftily atop Group B at the moment courtesy of victories over Greece and Nigeria respectively. The two sides meet tomorrow in the early kickoff at Soccer City. The Republic of Korea were comfortable victors of Otto Rehhagel’s Greece. The Euro 2004 champions were both lethargic and sloppy and possessed none of the defensive nous that saw them capture the European Championships six years ago. On the other hand, Korea were excellent. Their captain, Park Ji Sung, has excelled in the playmakers role for South Korea for years and demonstrated his immense capabilities in their 2-0 win. Lionel Messi was at his dazzling best in the Albiceleste’s 1-0 success over Nigeria. The tight scoreline flattered the Super Eagles and Nigeria will need to improve drastically if they are to have a future in the competition. Nigeria will face elimination from the competition should either South Korea or Argentina win and they are defeated by Greece. Lars Lagerbäck will refuse to accept a group stage exit and Nigeria should get the better of a Greek side devoid of ideas. To everyone’s surprise Slovenia sit in pole position in Group C. They capitalised on England’s 1-1 draw with the United States, beating Algeria 1-0. Slovenia were vulnerable on the flanks, where Ziani was a constant threat. The United States’ Clint Dempsey and Landon Donovan could pose similar problems to the Slovenians should they be allowed to transgress deep into Slovenian territory. Slovenia’s goalkeeper Samir Handanovic carried his remarkable Serie A form into the World Cup and will prove a difficult obstacle for Bob Bradley’s side. The United States themselves were lucky to escape from Rustenberg with a point, Robert Green’s now infamous catastrophy allowing Clint Dempsey to score. 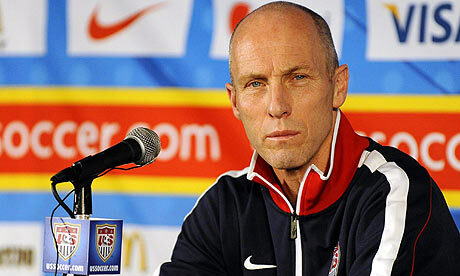 USMNT are capable of producing a much superior performance against Slovenia. The Americans’ defensive core of Oguchi Onyewu and Jay DeMerit were solid against England, a huge boon considering Onyewu’s terrible recent history of injury. Bob Bradley will need to consolidate that defensive strength with a more potent strike force if the United States are to wrestle command of the group out of Slovenian hands. England’s performance has been evaluated countless times since that night in Rustenberg. Last minute call-up Jamie Carragher was beaten easily on occassion by the pace of Jozy Altidore and if the rumours of him starting the next game are proven to be correct then John Terry will need to be on top form. The conundrum of who is the best candidate to partner Wayne Rooney in attack has not yet been solved by Fabio Capello. Emile Heskey’s performance against the United States was bafflingly praised by some pundits in the immediate aftermath of the game. The reality is that Heskey is not a striker of genuine international-quality. Perhaps the best solution for Fabio Capello would be to move new captain Steven Gerrard forward into a support role for Rooney with a four man midfield behind the two. It is no surprise that Germany are the stand out performers in Group D thusfar. Their 4-0 demolition of Australia was founded on individual brilliance from Mesut Özil and Lukas Podolski and fantastic distribution and holding from Sami Khedira and Bastian Schweinsteiger. It will be a great relief to Jogi Löw to see Miroslav Klose and Lukas Podolski performing so effectively after both had endured difficult seasons for their club sides. Australia on the other hand seem destined for elimination. They were powerless to prevent a drubbing at the hands of the Germans and to make matters worse their talisman, Tim Cahill, has been suspended. They must now face Ghana, who were better than their 1-0 scoreline indicates. Stade Rennais’ Asamoah Gyan gave the Black Stars victory over Serbia. The real star performer, however, was Kevin Prince Boateng. The Portsmouth midfielder was busy, creative and determined against the Serbs and if he can continue that form against Australia then Ghana will stand on the brink of qualification for a second successive place in the last sixteen. Serbia were predestined to be the tournament’s dark horses. They were abject against Ghana. Their celebrated defence was challenged by an under-strength Ghana and it is forgivable to think that they will have even greater difficulty against Germany’s multi-pronged attack. Holland failed to reach their potential against Denmark but still managed to escape with a comfortable 2-0 victory. The return of winger Arjen Robben will only add further strength to their challenge and they may yet become the swaggering champions that a large section of the world’s observers reckon they were born to become. The revelation of the game against Denmark was Eljero Elia. The young Ajax winger replaced Rafael van der Vaart and made an immediate impact. His energy and innate skill were clear to see and further appearances for the youngster are almost a certainty now. Japan were everything their reputation told us they were. They were organised. They were boring. And they numbed Cameroon into submission. Keisuke Honda’s goal gave them a 1-0 victory over the Lions. They will not be so fortunate against Holland. Cameroon’s performance was toothless (pardon the pun). Samuel Eto’o was the only player to emerge with any credit and even he seemed powerless to prevent Japan from hanging on to a clean sheet and a victory. Cameroon should improve against Denmark, they have too many players of high quality not to. A victory is required. Anything less may spell an embarrassing early exit. The immediately striking aspect of your first glance at the Group F table is Italy’s absence from top spot. The World Champions were perhaps the better side against Paraguay but could not convert their superiority into sincere shooting opportunities. If Marcello Lippi insists on keeping the 4-2-3-1 formation then he will need to remove Iaquinta. The Juventus forward was unthreatening throughout the encounter with Paraguay and his place in the starting line-up ahead of Antonio Di Natale is ponderous at best. Of more immediate concern to ‘gli Azzuri’ is the fitness of Gianluigi Buffon. The decorated goalkeeper has suffered a recurrence of a herniated disc and may play no further part in Italy’s quest to retain the World Cup. Into the breach will step young Federico Marchetti. The Cagliari goalkeeper was a revelation in Serie A this past year and may yet prove to be a worthy replacement to one of the world’s greatest shot-stoppers. Slovakia controlled the game against New Zealand but concentration lapses ultimately proved to be their undoing. Marek Hamsik, their captain and Vladimir Weiss were stand-out performers against New Zealand and must retain their creative flair if they are to overturn Paraguay as the second side to progress from the group. There is a feeling that New Zealand have already achieved what they set out to do in drawing with Slovakia. It is unthinkable that they may claim another point against Paraguay or Italy despite their obvious strenghts in defensive organisation. Brazil showed their usual flair but were unable to score more than two goals against North Korea. Robinho and Maicon were the outstanding performers on the night for the Seleçao. They should prove too strong for Portugal, who were terrible against the Côte d’Ivoire, but may yet be tested by the Elephants. North Korea were the unknown quantity in the ‘Group of Death’. Their star player, Jong Tae Se, garnered a lot of attention for his tears at the national anthems and his subsequent display which culminated in an assist. Côte d’Ivoire were far more structured than they were in the Cup of African Nations. In Gervinho and Salomon Kalou they have players to supply the now fit Didier Drogba and also to beat fullbacks. If they can achieve a draw against Brazil and proceed to thrash North Korea, then the Brazilians may yet face an unlikely elimination from the World Cup. This group looked to be all about Spain. The European Champions and favourites to lift the World Cup were expected to breeze through this group with minimal fuss. They did not expect to encounter the managerial powerhouse that is Ottmar Hitzfeld and his appropriately strong Switzerland defence. The Swiss demonstrated the frailties within this otherwise exceptional Spain side. Spain were unable to show the requisite cutting edge and for all of their possession, they mustered very few threatening attempts on goal. They will have a chance at redemption against Honduras, who were disappointing against Chile. Chile were every bit as entertaining as we were led to believe. Marco Bielsa has created an attacking side with a remarkable flair and creativity to it. The tactical decision to field only three players was not exposed as folly by a blunt Honduras but achieving the same result against Spain may prove to be too difficult a challenge.